In a previous issue of AWARE we looked at the benefits of tabletop response exercises between pipeline operators and emergency response organizations. This article looks at general “ground rules” for such drills, as well as tips to ensure that all parties get the most benefit out of the experience. Tabletop exercises are discussion based sessions that allow participants to walk through a scenario (simulated incident) and discuss rolls and responsibilities and how an incident would be handled in a real situation. Effective exercises should ideally be interactive and designed to solicit comments and feedback from all participants. Key considerations that might be included in an exercise include impact zones, possible staging areas, and effects of weather, traffic patterns, evacuation considerations and discussions of where to establish Command Posts and resources that should be available to an Incident Commander. Specific to the scenario that triggers the exercise, all key elements of the functional organization should be involved. The discussion should be designed to reinforce responsibilities and procedures. The focus should be on discussing resources, needs and high-level actions; ideally this drill should focus more on strategy than tactics. Necessary notifications to parties outside of the organization should be discussed and noted. Upon review, members will discuss the positive and negative points of the exercise and provide specific recommendations to improve performance. A report consisting of a summary of the incident, problems encountered, actions required and recommended solutions shall be prepared and distributed within the functional team for review. Establish protocols for regularly scheduled information updates (it is recommended these updates be provided every 30 minutes on the half hour during the early stages of an emergency). 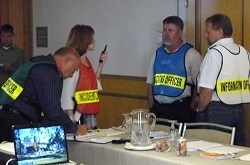 Provide training to first responders on how to properly hand-off on-scene media representatives to our organization’s designated spokespersons. Develop checklists of resources available to Incident Commander, including a means to track parties/resources in the Command Post. Developing and maintaining relationships with emergency responders in the communities in which we operate is a critical piece of Denbury Resources’ Public Awareness program. In addition to meeting face-to-face with emergency response personnel annually, we also invite them to participate in our annual tabletop drills. Tabletop exercises give us the chance to interact with emergency responders allowing for the opportunity to discuss specifics of pipeline operations and our associated emergency response procedures. In preparation for a tabletop drill, local Denbury management personnel plan the exercise with scenarios ranging from a severe weather event to a pipeline leak. Tabletop drills typically begin with a safety briefing and an orientation. Exercises with operations personnel and any emergency responders attending will typically last around 2 hours. After the tabletop is completed, there is a quick debrief to discuss what worked, what didn’t, and what can be improved. These takeaways are not only operational but are also strategic, giving operations and emergency response personnel alike the opportunity to focus on better preparation in the event of an actual accident or incident. During these tabletop exercises, emergency responders that attend are provided with county maps and Denbury brochures. Denbury county maps include basic information on the size, diameter, and location of the pipeline in each county, while brochures focus on specific properties of the product transported, recognizing a leak, and emergency contact information. For more information on conducting a tabletop drill with Denbury, or for scheduled upcoming exercises, please email aware@denbury.com . Denbury’s primary objective is on enhanced oil recovery utilizing carbon dioxide (CO2 EOR), and with 437.7 million barrels of oil equivalents (MMBOE) of estimated proved oil and natural gas reserves spaced across two key geographic regions, the Rocky Mountains and the Gulf Coast, our operations are very unique. Our Gulf Coast region’s primary CO2 source comes from Jackson Dome near Jackson, Mississippi. It is believed that Jackson Dome is the only pure source of naturally occurring CO2 (98% CO2) east of the Mississippi River. Denbury Resources purchased Jackson Dome and the 183-mile NEJD CO2 pipeline in 2001. NEJD CO2 pipeline runs from Jackson Dome to near Donaldsonville, Louisiana. Since the acquisition of NEJD CO2 and Jackson Dome, we have acquired or constructed nearly 750-miles of CO2 pipelines in the region: the Free State Pipeline, The Green Pipeline Texas and the Green Pipeline Louisiana, Delta Pipeline, and the West Gwinville Pipeline. 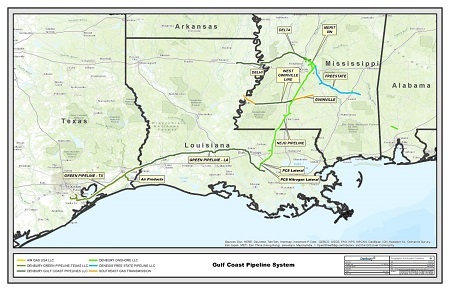 The Green Pipeline, the largest of our pipelines in the area, runs from Donaldsonville, Louisiana and westward towards Hastings Field near Houston, Texas. The Free State Pipeline primarily transports CO2 to our four existing tertiary fields in East Mississippi (Eucutta, Soso, Martinville, and Heidelberg). Our tertiary operations in the area include Delhi Field east of Monroe, Louisiana, Hastings Field south of Houston, Texas, Heidelberg and Tinsley Fields in Mississippi, and Oyster Bayou Field east of Galveston Bay, Texas. These fields account for 36% of our total CO2 EOR production in 2013 and approximately 21% of our year-end proved tertiary reserves. If you, or another emergency responder you know, would like to receive "AWARE", please subscribe below. To locate hazardous liquids and natural gas pipelines and their operators in your area, please visit the NPMS. If you are a government official, you may request more detailed access specific to your county. To view previous issues of "AWARE", please visit the the Denbury "AWARE" archive. All of the Denbury carbon dioxide (CO2) pipeline systems utilize valves to control flow and relieve pressure within the pipelines. Valves are one method by which Denbury and other Operators are able to safely maintain and control the transportation of CO2 by pipeline. An automated valve is one that can be opened or closed using an electronic or pneumatic signal that causes a valve actuator to physically change the position of the valve (Open/Close). Denbury uses automated valves to isolate segments of their pipeline for maintenance, to control conditions along their pipeline systems and to protect their pipelines from operating outside of their design parameters. Automated valves can be operated remotely or locally or they can be designed to control conditions without any human intervention (i.e. Control Valves). Remotely controlled valves are operated from a remote location such as a central control center or field location. Valves in highly sensitive areas or remote locations are more likely to be remotely operated. 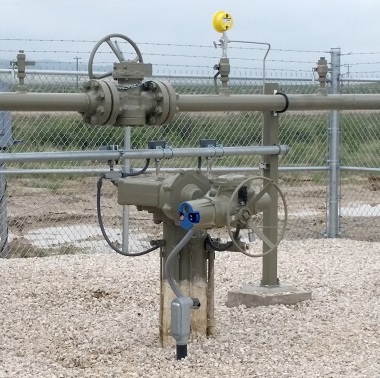 Automated valves can also be operated locally, directly by Pipeline Operators who have the ability to isolate segments of the pipeline for maintenance activities and in order to maintain safe and efficient operating conditions. A control valve is a special category of automated valves designed to keep pipeline conditions as close as possible to a desired set point without any human intervention. These valves utilize complex control systems to sense pressure or flow conditions and automatically make corrections to keep the desired set point within a safe range. Pressure relief valves and thermal relief valves are another category of valve, designed to prevent the internal pressure of the pipeline from reaching an established upper limit during operations (set point). This is accomplished by setting parameters on the valve that will allow the pressurized fluid to flow out of the system at the desired set point. In the unlikely event of a CO2 pipeline leak, a significant change in pipeline pressure would trigger an alarm at Denbury’s Gas Control Center (24/7 Operation) at which time a Pipeline Controller will initiate a command to close the upstream and downstream valves in order to isolate the affected pipeline segment. 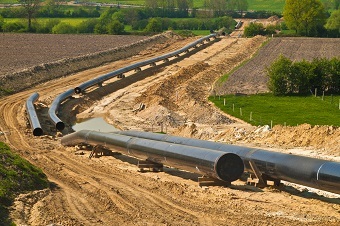 The benefits of monitoring the pipeline system conditions from a centralized 24/7 control center is that leaks can be detected quickly, the size of a subsequent release can be minimized, safety is enhanced along the pipelines and the downstream pipeline system is protected in the event of an operational upset. Other operating practices such as use of the One-Call system (811 Call Before you Dig), aerial patrol of the pipeline and personnel surveillance of the pipeline are additional tools that Denbury uses to keep our pipelines safe and leak-free. An example of an emergency response scenario for a CO2 pipeline: It’s 4:30 p.m. on a Friday afternoon. A road construction contractor is conducting grading and drainage improvements in advance of a roadway resurfacing project on Highway 44. The crew foreman is pushing the track hoe operator to finish digging before a pending thunderstorm brings significant rainfall to the area. As the track hoe bucket reaches for one more load of soil, the CO2 pipeline is damaged; subsequently a loud roaring noise is heard followed by the initial development of a white vapor cloud in the excavation. Shortly thereafter, the traffic on Highway 44 has increased and in some areas has come to a standstill. On-lookers have gathered in proximity to the rupture site and are taking pictures to post on social media sites. A reporter and camera crew from 26 Eyewitness News has arrived on site and is requesting information from emergency responders and pipeline personnel. What are the strategic and tactical response priorities? What might the Incident Command System structure look like for this incident? What are the physical properties and hazards associated with the product being released? How are the public sector responders coordinating with the pipeline operator to respond to the incident? How is the traffic congestion and request from the news media personnel addressed? This scenario can be used for discussion during a roll call or crew safety meeting. Are you familiar with how to handle a response to a CO2 pipeline incident? Pipeline operators are eager to meet with public sector responders and discuss their operations and how to work together in the unlikely event of a pipeline emergency. Denbury’s first CO2 pipeline in the Rocky Mountain Region was the 232-mile Greencore Pipeline completed in 2012. This 20-inch CO2 pipeline begins at the ConocoPhillips Lost Cabin Gas Plant in Fremont County, Wyoming, and terminates at Denbury’s Bell Creek Field in Powder River County, Montana. The purpose of the Greencore Pipeline is to transport CO2 to petroleum reservoirs for enhanced oil recovery in Denbury’s Rocky Mountain region. To view previous issues of "AWARE", please visit the Denbury "AWARE" archive. Denbury has a long-standing commitment to the highest standards for the safety of our employees, contractors, and local communities. Thus, emergency response planning is critical and we focus on incident prevention through our project designs, planning, implementation, and execution. To ensure that we are always prepared to respond quickly and efficiently to any incident that may occur, we have developed a company-wide emergency response plan (ERP), as well as individual plans tailored for our local facilities. Our company-wide emergency response plan is centered on responding to various situations including spill response, well control events, natural disasters, fires, pandemics, and categorizing emergency situations in a “tiered” manner depending on the severity. In addition to providing emergency response procedures and event classification, we have also developed an extensive notification system based on the possible exposure and scope of the incident. Our ERP not only provides guidelines for Denbury personnel, it also defines organizational lines of responsibility during a crisis. Denbury’s ERP is focused on utilizing the NIMS-Incident Command Structure (ICS). Through the ICS chain we have selected internal and contractor personnel who would be best equipped to respond and muster resources in the event of an incident, as well as alternate individuals who may serve in their absence. Since our operational areas in the United States are so geographically diverse, we recognize the need for emergency response plans tailored to specific locations and facilities. Our ERP specifies the importance of training, and each of our local facilities conducts a tabletop drill annually to test our personnel, resource allocation, and ensure we are prepared to respond to any type of incident. During a training exercise or incident, Denbury personnel thoroughly record event details to later analyze the responses and procedures used to determine their effectiveness. By pouring over the incident data or drill specifics in a non-incriminating manner, we are able to generate a comprehensive after-incident report. These reports provide feedback of the lessons learned, and most importantly, specific recommendations for preventing and improving response procedures for future incidents. A key challenge in forging a strong relationship between pipeline companies and emergency response organizations can sometimes exist in finding common ground for a constructive dialogue. While annual face-to-face meetings are a beneficial key component, these meetings typically provide general information on facilities and operations, but may not focus on response techniques. Based on polling published in a recent “White Paper” by the Interstate Natural Gas Association of America (INGAA), a broad cross-section of emergency responders stressed the importance of finding practical ways to improve their training and understanding of pipelines and the products transported. 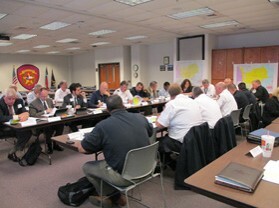 There are several methods which aid in educating emergency responders and one of the most effective is a joint tabletop exercise. These exercises enable pipeline companies and response agencies to practice the coordination of an effective response to a pipeline incident and engage in critical two-way communication. These discussions allow companies to speak specifically about the products they transport in their pipelines, exposures, response procedures, etc. in a facility-specific manner, and allow emergency responders to communicate their response needs and capabilities as well. Effective tabletop drills have several common elements. Ideally they should be interactive and designed to solicit feedback from all participants, not just involve the facilitator. They shouldn’t overly rely on a slide presentation, map or schematic to drive the exercise, but instead these tools should be used to enhance discussion. Dialogue and communication are critical components of an effective exercise and should be the primary method of training, with less concentration on lecturing or presenting to the audience. Effective drills involve relevant scenarios and event triggers that are relatable to both emergency responders and company resources. Realistic scenarios tend to attract the attention of attendees who are then more likely to actively participate. Another way to encourage engagement is by using actual, rather than hypothetical or generic locations and situations. Discussion of topics such as: impact zones, possible staging areas, weather conditions, wind direction, traffic patterns, and potential command post locations also increases realism and interaction. It is important to ensure that the scenario is not too operationally complex, as it may dilute key themes, focus or takeaways from the exercise. In the next issue of Denbury “AWARE”, we’ll look at ground rules and analysis techniques for conducting effective drills and exercises. If you are interested in conducting a joint drill with Denbury operations in your area, please email aware@denbury.com for more information. 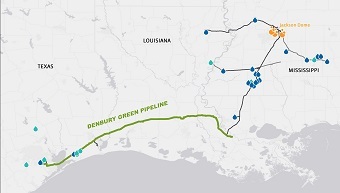 Denbury’s Green Pipeline was built in 2010 and transports CO2 from Donaldsonville, Louisiana southeast of Baton Rouge, and on to Hastings Field, south of Houston. The 325-mile pipeline consists of the Green Pipeline Texas (125 miles), and the Green Pipeline Louisiana (200 miles). This pipeline traverses ecologically sensitive areas, including Galveston Bay, the Dickinson Reef Complex, the Houston Navigational Channel, and the Nature Conservancy’s Attwater’s Prairie Chicken Reserve. Denbury takes being a “good neighbor” in the communities in which we operate very seriously, and this pipeline is no exception. Throughout construction we worked with the Texas Parks and Wildlife Department on identifying potentially fragile ecosystems, and even building seven small reefs south of the Dickinson Reef Complex to offset any potential temporary upsets. 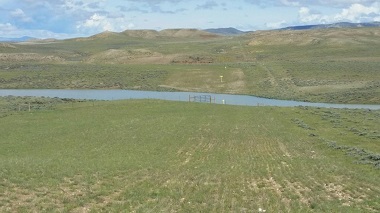 Rather than disrupting the fragile shoreline and wetland ecosystems nearby, horizontal directional drilling (HDD) techniques were utilized to trench below the area. Completion of the Green Pipeline has allowed Denbury to perform the first CO2 injection into Hastings Field, near Houston, TX and allows transport of CO2 to oil fields along the Gulf Coast. Currently, most of the CO2 flowing through Green Pipeline originated in the Jackson Dome, Mississippi area, but Denbury began receiving anthropogenic (man-made) CO2 in 2012 from an industrial facility in Port Arthur, Texas. Owned by Denbury, Jackson Dome is a large and relatively pure source of naturally occurring CO2 (98% CO2) and is, to our knowledge, the only significant underground deposit of CO2 in the United States east of the Mississippi River. The large volumes of CO2 found in this area, have allowed us to significantly enhance production, and in 2013 we began to purchase anthropogenic CO2 to better meet the energy needs in this region. Naturally occurring and anthropogenic CO2 sources paired with CO2 pipeline infrastructure provide a significant strategic advantage and will allow Denbury to recover additional oil from mature oil fields in the Gulf Coast region for years to come. If you would like more information on Denbury’s Pipeline Operations in the Gulf Coast Region, please go to here. CO2,Oil and Natural Gas Pipelines- What’s the Difference? The production of oil and natural gas is critical in meeting our country’s significant energy demands. While oil and natural gas pipelines are most common, accounting for 99% of the nation’s pipeline infrastructure, the transportation of Carbon Dioxide (CO2) via pipeline is becoming more prevalent as our nation moves towards energy independence. The main driver for the increase of domestic CO2 pipelines is the implementation of enhanced oil recovery utilizing carbon dioxide (CO2 EOR), a method which increases oil production in depleting oil fields. Though the transportation methods of oil, natural gas, and carbon dioxide may be similar, these products have very distinct and differentiating characteristics. Unlike natural gas, CO2 is heavier than air. Therefore, in the unlikely event of a leak or release, CO2 will dissipate slower than natural gas and could accumulate in low-lying areas, displacing oxygen in the affected area. Since natural gas is lighter than air, in the event of a natural gas leak it will quickly dissipate into the atmosphere. In the event of an oil leak, liquid pools and/or an oily sheen on water will be present around the damaged sections of the pipeline. If exposed to the atmosphere, CO2 transported in liquid form inside of a pipeline will transform into a gas due to temperature and pressure changes. A further differing characteristic of CO2 is that it is odorless, unlike oil, but like natural gas in its original state. The rotten-egg smell associated with a natural gas leak actually comes from an odorant added as a safety precaution to aid in leak detection; CO2 does not have any odorant added to it. (1) Non- toxic but can act as an asphyxiant in large amounts. While truck, rail and ship are all methods for transporting CO2, oil and natural gas, statistically the safest and most effective mode is via pipeline. In the United States alone there are over 2.5 million miles of pipelines, enough to circle the earth over 10 times! 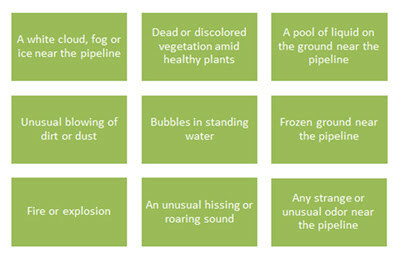 Within the classification of regulated pipelines there are two main types - hazardous liquids pipelines and gas pipelines. Though CO2 is non-toxic in small amounts, both crude oil and CO2 are recognized within the family of hazardous liquids pipelines. In 2013, the Pipeline and Hazardous Materials Safety Administration reported there were over 350,000 miles of natural gas pipelines, and 192,396 miles of hazardous liquids pipelines. CO2 pipelines account for 4,500 miles within the hazardous liquids pipeline category. While CO2, oil and natural gas vary in their physical properties, they are a critical component of our country’s energy infrastructure and play a role in our daily lives. For more information on enhanced oil recovery utilizing CO 2, please visit www.denbury.com. For more information on oil and natural gas pipelines please visit www.aopl.org and www.ingaa.org. 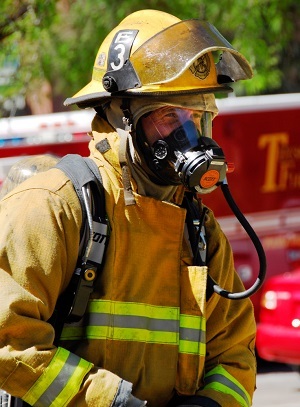 When responding to a CO2 leak or release, emergency responders should arrive on-scene with appropriate personal protective equipment (PPE), including turnout gear, mask and a self-contained breathing apparatus (SCBA). Wearing a SCBA is a particularly critical precaution in these situations due to the risk of CO2 displacing oxygen in the affected area. Prior to, or upon arrival, first responders should reference any pipeline maps previously provided by pipeline operators. These maps include critical information such as the start location, product and quantity of product transported, isolation valve placement, and termination points. Maps for pipelines located in counties and parishes in which Denbury operates are available to emergency responders upon request by emailing aware@denbury.com. Upon arrival, the scene must be evacuated quickly, and any non-essential personnel must stay away from the hazard area. One of the first steps should be the establishment of hot, warm and cold zones, a decontamination zone, and medical evaluation areas. Should there be any injuries at the scene, responders should not attempt to assess a patient’s vitals in a hazardous atmosphere, but instead should evacuate the patient as quickly as possible to the cold zone or medical evaluation area for an examination. Others who may be in the area should be removed as quickly as possible. During the response it is critical that oxygen gas detectors such as an “MSA” or “QRAE” devices are used to monitor the amount of oxygen in the atmosphere. CO2 has a density of almost 1.5 times greater than oxygen, meaning it will congregate in confined spaces close to the ground. Due to this, proper ventilation is the most important mediation tactic that can be performed at the site of a CO2 incident. Using positive pressure ventilation (PPV) systems found on fire trucks, or booster fans, the area can be properly ventilated in most cases. When preparing to leave the “hot zone” and enter the decontamination zone, always ensure that an oxygen deficient atmosphere does not exist prior to removing your PPE and SCBA. For more information on CO2 pipelines, map requests or to contact Denbury personnel in your area, please email aware@denbury.com. It is imperative that a solid, trusting and open relationship exist between emergency responders and representatives of pipeline companies, especially since they share a common and overriding objective – public safety. While maintaining a regular, on-going and focused dialogue with emergency responders and other key external stakeholders is a critical component of new standards for public outreach adopted by the pipeline industry; some respected companies have seen the benefits of education and collaboration for many years. Additionally, relationships between companies and response organizations can be established through various drills and exercises. These can take the form of “stay in the room” tabletop exercises, or can involve full-scale response drills with both parties dispatching personnel to an incident scene and testing response to a hypothetical incident involving a realistic scenario. Effective drills not only provide “hands on” experience, but serve to reinforce training in a more effective and relatable manner. Progressive companies and response organizations use drills as an effective tool in forging a common understanding of such elements as the Incident Command System (ICS) structure, measures for establishing command posts, means for testing communication methods and protocols, steps for coordinating humanitarian assistance efforts, and for jointly determining how they will work together to meet media and public requests for information. As is the case with any type of successful relationship, to be most effective in responding to an emergency situation, it is vital that both companies and response organizations share a common commitment and comfort level with each other BEFORE an emergency occurs. Such commitment requires effort and focus from both sides, as well as innovative approaches in training and dialogue. Ideally, communication is never-ending, and is an open dialogue between both parties. When responding to a CO2 leak or release, emergency responders should arrive on-scene with appropriate personal protective equipment (PPE), including turnout gear, mask and a self-contained breathing apparatus (SCBA). Wearing a SCBA is a particularly critical precaution in these situations due to the risk of CO2 displacing oxygen in the affected area. Prior to, or upon arrival, first responders should reference any pipeline maps previously provided by pipeline operators. These maps include critical information such as the start location, product and quantity of product transported, isolation valve placement, and termination points. Maps for pipelines located in counties and parishes in which Denbury operates are available to emergency responders upon request by emailing aware@denbury.com . For more information on CO2 pipelines, map requests or to contact Denbury personnel in your area, please email aware@denbury.com . To locate hazardous liquids and natural gas pipelines and their operators in your area, please visit the NPMS . This newsletter entitled “Aware” is one of various efforts to improve our on-going dialogue regarding our operations, as well as our pipeline safety and emergency response procedures with the public safety community. Our intent is that this newsletter be informative and demonstrative of our commitment to enhancing our relationship with the emergency responders and safety officers in communities where we operate. Thus we encourage the distribution of this newsletter to others in your field. In the next issue of “Aware”, we will further explore the differences between CO2 pipelines and those that transport the more well-known commodity, natural gas. Denbury Resources Inc., is a growing domestic oil and natural gas company headquartered in Plano, Texas. As of December 31, 2013, our proved oil and natural gas reserves were estimated at 470 million barrels of oil equivalent, of which 83% is oil. Our primary focus is on enhanced oil recovery utilizing carbon dioxide (CO2 EOR), and our operations are focused in two key operating areas: The Gulf Coast and Rocky Mountain regions. Currently our properties in the Gulf Coast region are situated in Mississippi, Texas, Louisiana and Alabama, and in the Rocky Mountain region in Montana, North Dakota and Wyoming. Our goal is to increase the value of acquired properties through a combination of exploitation, drilling and proven engineering extraction practices, with the most significant emphasis relating to CO2 EOR. To date, our CO2 EOR operations have resulted in the gross production of over 100 million barrels of otherwise stranded oil, increasing domestic oil production and subsequently promoting our nation’s energy independence. Out of our 1,501 employees, 807 are engaged in field operations. Our people are truly our most important asset, and in our opinion among the most qualified and experienced in the oil and gas industry. To ensure the safety of our employees and those within the communities in which we operate we have added key personnel to advise and manage the continued improvement of our training. Our workforce is qualified to perform pipeline safety related tasks and are routinely evaluated under the vigilant oversight of the US Department of Transportation (DOT). In addition to meeting the standards established by the DOT, we undergo regular compliance audits of our operations, and assess emergency response preparedness through various training exercises. At Denbury we are an industry leader in using carbon dioxide to generate oil production. Utilizing an innovative and repeatable process, Denbury is able to recover additional oil from subsurface oil reservoirs, as well as provide a promising method to safely store industrial CO2 which may have otherwise been released into the atmosphere. The first step in implementing a CO2 EOR project is to secure access to substantial volumes of CO2. We source our CO2 from both naturally occurring underground reservoirs and anthropogenic (man-made) sources. CO2 reserves associated with our naturally occurring sources are located in Jackson Dome, Mississippi and LaBarge Field in Wyoming. In 2013 we began purchasing and utilizing anthropogenic CO2 from industrial facilities which capture, purify, dry and then compress the CO2 for delivery into our pipeline network. The second step is to dispatch the CO2 from various sources to our oil fields. The CO2 is transported in liquid form at high pressures via over 1,100 miles of federally regulated pipelines which are either owned or operated by Denbury. Once the CO2 is delivered, it enters the third step of our enhanced recovery process where it is injected into the oil-bearing reservoir. The injected CO2 moves through the reservoir mixing with the oil and reducing the surface tension between the oil and the formation, increasing mobility of the trapped oil. The combined mixture can then be more effectively driven towards a producing well-bore. This recovery process allows for additional production of oil that would otherwise be left behind. The final step of our repeatable process is to separate the CO2 and oil mixture through an assembly of processing stages which take place within our on-site recycle facilities. Once the oil is separated from the CO2, it is sold to a third party. The separated CO2 is then re-compressed and prepared for re-injection into the oil bearing reservoir. After the initial cycle is completed, subsequent injections utilizing the recycled CO2 will take place until the reservoir is no longer economically able to produce additional volumes of oil. After the CO2 EOR process is complete, the CO2 is stored in the same formation that had previously trapped the recovered oil. This innovative technology allows Denbury an environmentally responsible method of transporting and storing CO2 volumes in oil reservoirs while having the ability to contribute to our nation’s supply of oil at the same time. Denbury’s damage prevention program includes comprehensive procedures and a variety of methods to ensure safe operations of our pipeline systems. We design, install, test, operate, and maintain our pipelines to meet or exceed regulatory standards. Our employees are thoroughly trained to maintain and operate the systems safely, and we are proud of our safety record. Denbury operates carbon dioxide and natural gas pipelines in Wyoming, Montana, Texas, Louisiana, Mississippi, and Alabama. We take our responsibility seriously to ensure safe pipeline operations, but you too can play an important role in helping to prevent pipeline accidents. The Federally mandated “Call Before You Dig” number, 811 is the national one-call number for damage prevention of underground utility infrastructure. Coordinated by the Common Ground Alliance (CGA), 811 provides national coordination for all notifications of excavation work. When someone calls 811 with the intent of conducting an excavation activity (including digging, blasting, or drilling), they are automatically transferred to the appropriate state one-call agency who collects information concerning the location of the planned work. Nearby utilities and pipeline operators such as Denbury are then notified so they can mark their assets, and if needed, assist in coordinating a safe excavation. Once Denbury receives notification of planned excavation activity, trained and qualified personnel are dispatched to locate and mark the area. Anytime the pipeline must be exposed or crossed, Denbury personnel need to be on site to supervise the activity and ensure safety. Regular aerial patrols, as well as ground patrols, are conducted along Denbury’s pipeline assets to ensure safety, and to identify excavation activity that may encroach on the pipeline right-of-way. Any issues that are discovered through these observations are quickly investigated and mitigated. Denbury has a long standing commitment to safety. We consider the members of the emergency response community to be our partners, and we ask for your assistance in notifying the public of the importance of calling 811. While pipeline emergencies are not common, it is prudent for emergency responders to be able to recognize a potential pipeline emergency. Pipeline emergencies include any of the following: a weakened, damaged, or leaking pipeline, a natural disaster such as an earthquake, flood, or soil erosion, or a fire or explosion near or directly involving a pipeline facility. Upon discovery of a pipeline emergency, it is critical to leave the area immediately. Once in a safe location, notify the pipeline operator and call 911. Above-ground pipeline markers contain information identifying the operator and a telephone number to immediately connect with company personnel who can initiate emergency response procedures. In the event of a pipeline emergency, first responders should take steps to isolate the area, deny entry, and evacuate any individuals that may be in the hazard area. Elimination of all potential ignition sources, including motorized vehicles and equipment, electrical systems, open flames, radios, cell phones, appliances, and any other devices that could generate a spark should be removed as well. Once Denbury receives notification of a suspected pipeline emergency, we will promptly dispatch personnel to the scene to assist public sector emergency responders. All pipeline operations personnel are trained for emergency preparedness and are required to follow the company’s procedures during emergency situations. Denbury has a long-standing commitment to the highest standards for the safety of our employees, contractors, local communities, as well as the protection of the environment in which we live and work. To accomplish these goals, we believe Denbury must continuously improve the safety, well-being and development of our employees, implement the highest standards of environmental protection and ethical conduct, and work proactively to be a good corporate citizen by aligning our interests as a company with the interests in the communities in which we operate. Our oil and natural gas properties are concentrated in the Gulf Coast and Rocky Mountain regions of the United States. Our primary focus is on enhanced oil recovery utilizing carbon dioxide (CO2EOR). Our goal is to increase the value of acquired properties through a combination of exploitation, drilling and proven engineering extraction practices, with the most significant emphasis relating to tertiary recovery operations.